A meteorite explodes over the desert, sending fragments of black rock scatter everywhere. A local geologist brings one back to town to study. His partner, Dave Miller (Grant Williams), returns a day later to find the geologist dead and the lab destroyed by large black rocks. The dead man is rigid, his skin has lost all flexibility. Meanwhile a young girl falls into a catatonic state, she too was in possession of one of the black rocks. Dave struggles to understand the connection. 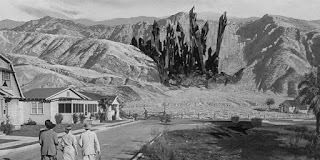 Out in the desert, after a rainstorm, giant black pillars begin to grow. Well, it's still better than a Wal-Mart moving into town. Despite what the trailer might lead you to believe, Monolith Monsters is far from an action packed story of alien terror, in fact it’s quite slow paced, perhaps too slow. Monolith Monsters might be a slog, it does offer a very unique opponent for its human protagonists. The alien force has no intelligence, no plan, it’s just an unyielding chemical reaction that threatens to overwhelm the town and eventually the world. Events play out much more like a natural disaster movie with the calcified victims adding a touch of horror. Monolith Monsters, much like Them (1954), and Tarantula (1955), trades on the isolation and mystery of the desert. It gives the film a sense of rising doom and calamity. The monoliths (multiliths?) are well realized creations using some good to occasionally great miniature and matte work. The sight of these massive towers of stone slowly rising, crashing to the ground and rising again is a surreal sight and it’s unfortunate that it never became an iconic moment of 50s SF film. 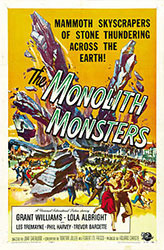 The title, although evocative, I think was the cause of many disappointed viewers who came in expecting giant rock monsters stomping into an unsuspecting town, only to realize they are watching an early eco-disaster movie. I was going to make a joke about how stoned you look, but that seems inappropriate seeing that you're dead and all. I think Monolith Monsters deserves much more credit that it’s given. 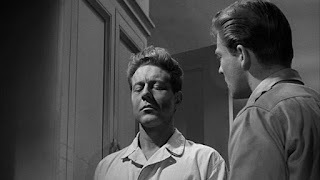 There weren't many SF films of the time that dealt with threats that weren’t from strange creatures, but rather forces of nature.Similar films such as When World’s Collide (1951) and The Magnetic Monster (1953), weren't common. If the Universal films of that era have anything like a lost classic, this one is it.